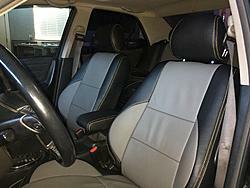 Clazzio seat covers for IS? Anyone have Clazzio leather seat covers for their IS300? I know this is an old thread, but Clazzio JUST made templates for the IS300... I have them! Is Clazzio now planning on producing covers for the IS300? Currently not in stock, but Black or Gray on the way, anything custom has to be ordered anyways. Quick Reply: Clazzio seat covers for IS?